Now boys and girls, when I first wrote about Van Meegeren, I talked about what is one of his more famous forgeries, The Supper at Emmaus, which was sold to a rich industrialist from Rotterdam in 1937. But the story goes back much earlier than that. You see, Van Meegeren was a career forger, it wasn’t mere vindictiveness that drove him on, it was business. His first known forgery is from 1923, a version of Hals’ Laughing Cavalier, which has its own great history that I hope to share with you someday. But Van Meegeren quickly moved on to forging Vermeers, and his first examples were even more wretched than his more famous endeavors. 5) Musical instruments are prevalent in many of Vermeer’s paintings, but in his amazing book False Impressions Hoving points out that the instruments are stunted and could not have been painted by a real connoisseur who understood their construction. Van Meegeren went on to sell this painting, and then used the proceeds to settle in the South of France for a spell while he (literally) cooked up his next Vermeer. Only this time, he didn’t just paint another Vermeer. 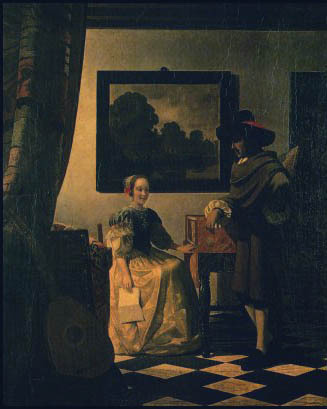 He decided to paint the Vermeer that would not only withstand aesthetic scrutiny, but scientific detection.